Fresh like a bouquet of lilacs!!! It was MADE for a little girl. OMG!!! it is beautiful!!! Now I want to make one in those very colours!!! Thanks so much for the tutorial!!! So pretty! I love the softer colors! This turned out so great! I can tell your daughter loves it and will cherish it for a long time. 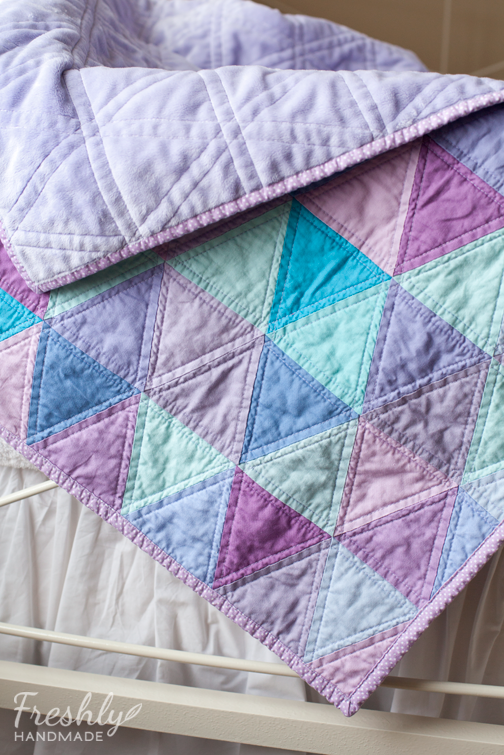 This quilt is so beautiful and your daughter has awesome taste ;o) Thank you so much for sharing the tutorial with us, I can't wait to make one of my own! This is AWESOME! Thanks SOOOO much for the tut Stacy! 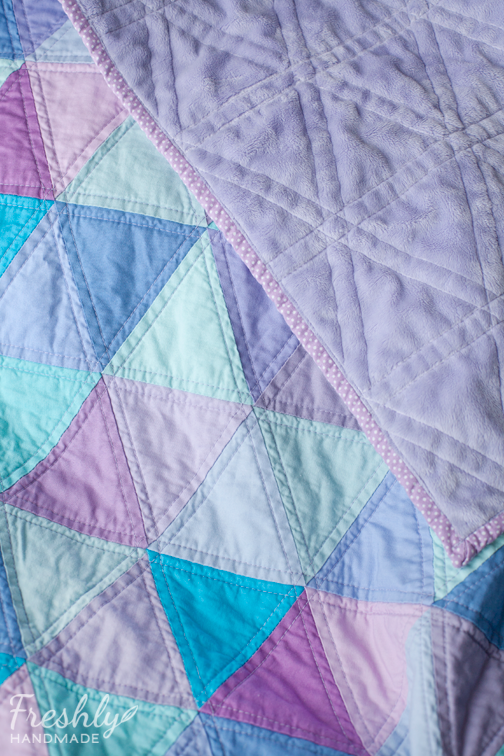 I absolutely love the colors in your daughters quilt - very soothing, perfect for naptime! She is so cute! This is gorgeous - now off to finish mine! Love the tips you gave, I already found a few I wasn't doing! Eeek! I have one question.......Do you have any advice for backing with minky? That is another thing I've thought and thought of trying but I feel very intimidated by how "slinky" it is. Did you spray baste, or pin? 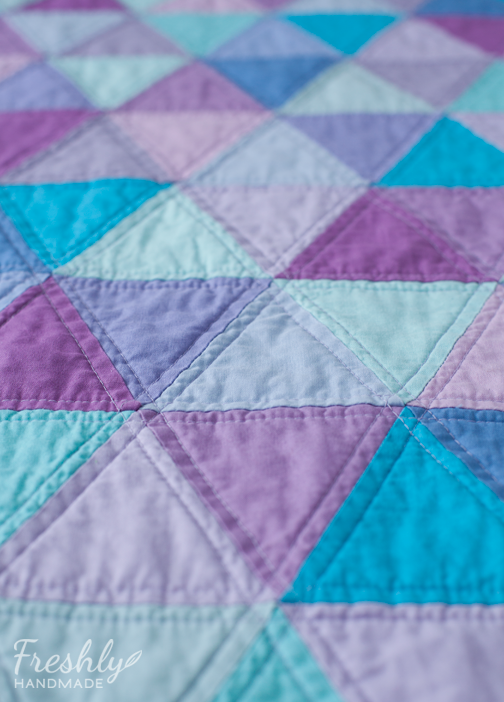 Did you have trouble with it shifting as you machine quilted? 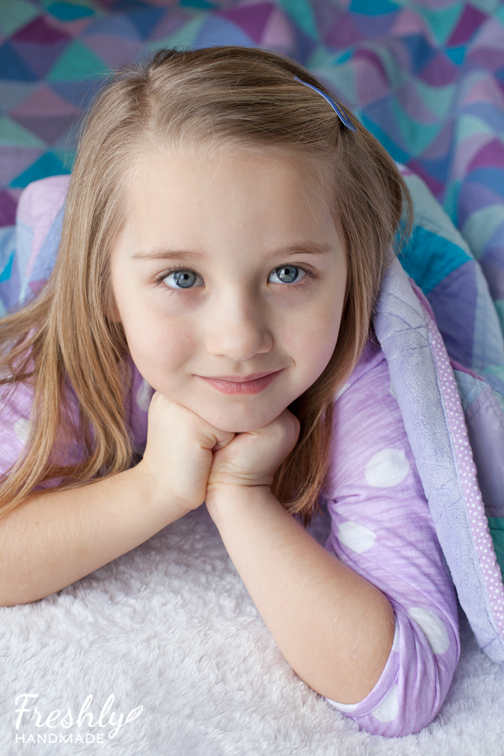 Your lucky girl is sure to get lots of enjoyment out of her beautiful new quilt. Spray basting is key for minky! Lovely pictures, lovely daughter and lovely quilt! I love the blue & lavender what a beautiful combination. Thanks for sharing the free pattern. This is so sweet! Thank you for sharing the pattern! This is too pretty! Oh my! I love it!! congrats!!! Oh, my, this is gorgeous!! I love purple, too. I also love how you used the minky fabric on the back! Thanks for sharing the tutorial. 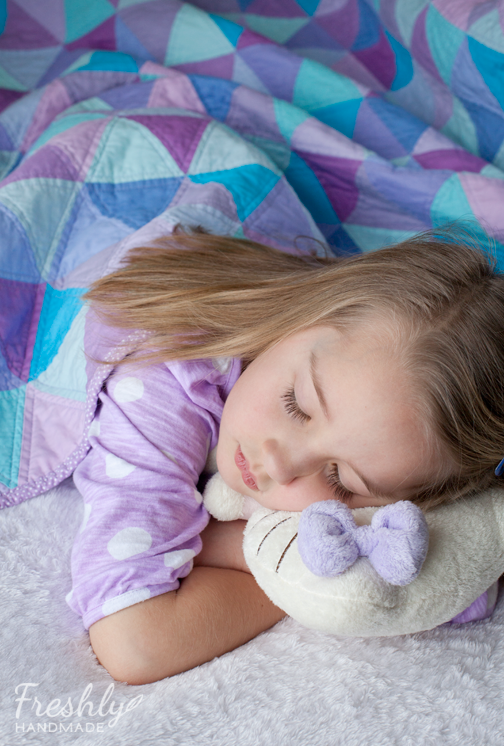 Know she will cherish this quilt! Thanks so much for the tutorial. This quilt came out beautifully. I'd love to do one in greens for my little guy. Now, can you offer a tutorial on how you get your 5 year old to NAP??? Even the allure of a green quilt couldn't convince mine! This quilt is just beautiful!! The pattern is great, showing exactly where to line them up before sewing is something many don't do. Thanks for sharing! 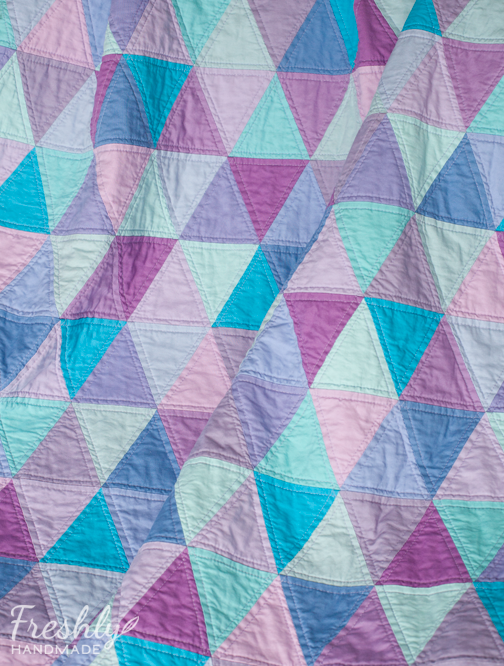 the colors in this quilt are so soft and pretty, almost like fluffy cotton candy! I love it, and I really enjoyed looking around your blog. I'm a new follower! What a wonderful quilt. So sweet, just like taffy...my favorite candy! Thank you for the tute, I've always wondered how to do that kind of quilt. Lovely! Your model is adorable! 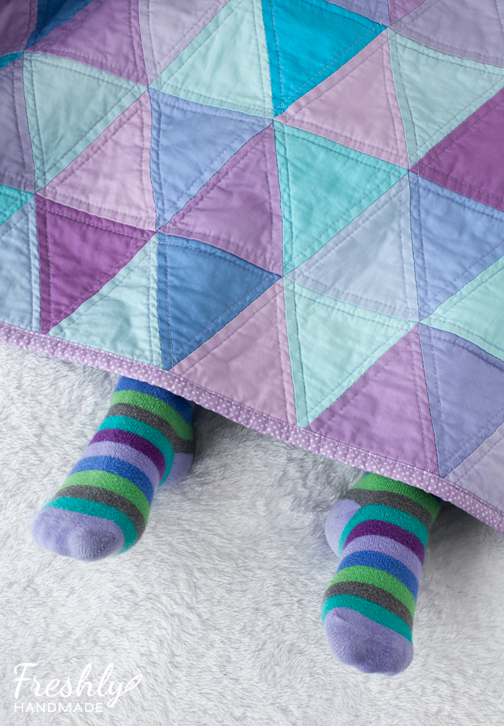 That is so pretty...my little girl would LOVE a quilt like that! I've never used minky as a quilt back. I'll have to try that sometime. It looks so cozy! So pretty! I love the color palette you chose. Great photos, too! The quilt and colors are beautiful. 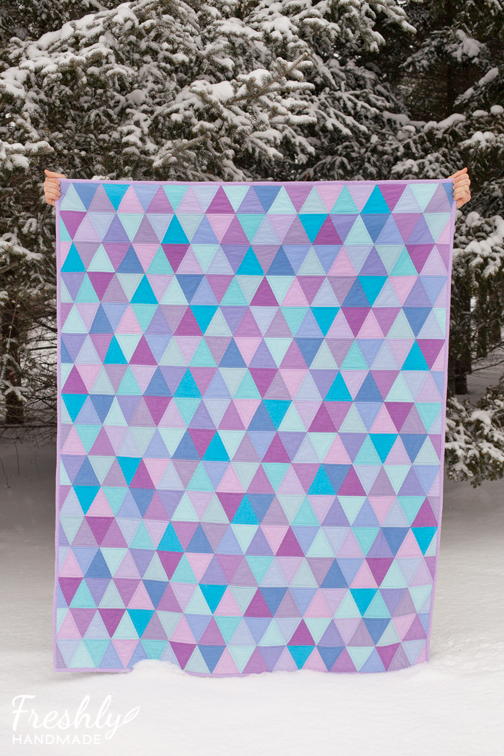 One of my 2014 goals is to make a triangle quilt with fabric I purchased last year. Thanks for the tutorial! 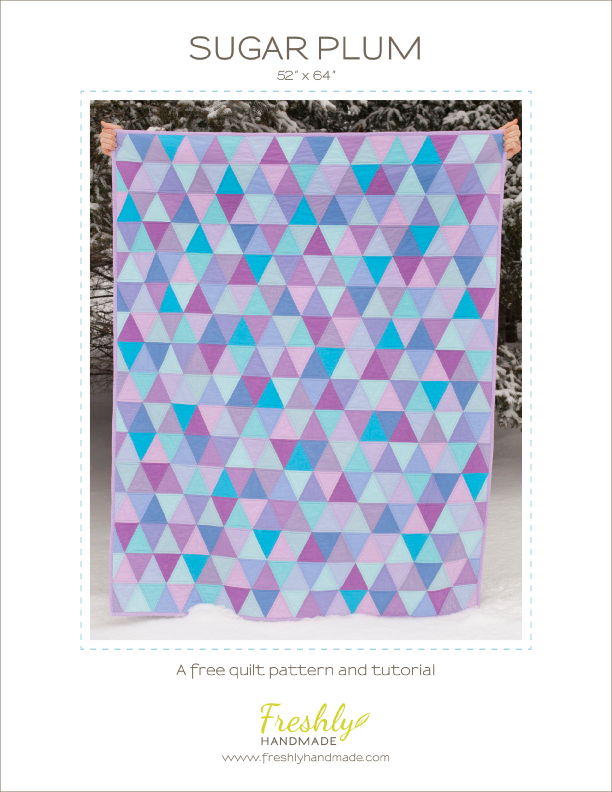 Lovely quilt, I'd like to try a triangle quilt at some stage, it's definitely on my list so thanks for the tutorial. Great photos. Just GORGEOUS! And the quilt is nice, too! *Wink, wink* Love the colours. Your daughter has great taste. Thanks for sharing. what for a beautiul quilt! I just wanted to say thank you! Your pattern and instructions helped me make my first quilt ever! It's not perfect, but I made it for my new baby cousin, Scarlett. Her parents love it. I did back it with rosette minky, which was a challenge, mittered corners were the bane of my existence, but I finished it. I'm quite proud of it. I'll email a picute, not sure how to upload it to comments. I just emailed you a picture. Thank you for posting the exact fabrics! I have a hard time visualizing patterns in other colors, but if I love it the way it is shown, then I have to almost duplicate it to be happy. I was able to buy the same fabrics, so I should start soon. SUPER energized to make another quilt.